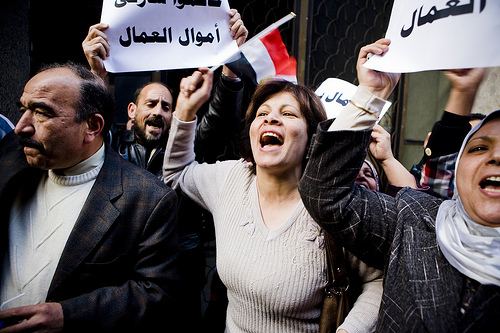 The popular revolts in Tunisia, Egypt and elsewhere in the middle east are driven by a profound democratic impulse. This represents both learning and test for international democracy actors, says Vidar Helgesen. What does Libyan revolution mean for bit.ly? DomainWire asks what will happen to the popular bit.ly URL shortener if Libya shuts down its Internet service (.ly is the country code for Libya). Several people have noted that no matter how cute the .ly suffix is to us in a domain name, it is ultimately controlled for a loony dictator, and therefore perhaps not suitable as a piece of global network infrastructure. We welcome a guest column by AAA member Sami Hermez (PhD, Princeton University). Sami is a Visiting Fellow at the Centre for Lebanese Studies at St. Antony?s College, University of Oxford. I was in Lebanon when the Tunisian revolt began. I attended an event with activists that made me feel hopeful because it was the first time that a large group of people came to rally behind a cause that was not Palestinian or Lebanese. Soon after, I was in Oxford when Tunisian President Zine El Abidine Ben Ali was deposed, and when the Egyptian revolts broke out days later on January 25, 2011. Tens of thousands of people took to the streets that day, in what was seen as an unprecedented act in Egypt. Since then, people in Egypt have inspired me, and I have been left in awe and disbelief that President Hosni Mubarak has been toppled and his regime left in decay. The revolts in Egypt and Tunisia left over 500 dead and thousands injured. It is these people?s sacrifices that I want to reflect on, and on their ability to sacrifice themselves for change, a powerful phenomenon that no regime could ever take away from its people. Jordanians will tell you that they are not known for being a happy people. On occasions such as a football victory, with cars honking and shouts of joy, onlookers will point out that, unlike a typical day, Jordanians are smiling. Participants of the hashtag #Jordanianlies are out to prove the stereotype wrong. #Jordanianlies features statements Jordanians hear that are often untrue. Thus, the hashtag uses humor to point out faults in Jordanian society. While the majority of #Jordanianlies posts center on gender relations, work situations, and everyday life, a few have ventured into political criticism. With their admirable courage and perseverance the Egyptian people have achieved a great success in toppling a corrupt dictator. But have they pushed their revolution far enough forward to prevent the US-backed army and dominant classes aborting the whole process? Remember, in a former post, when I said that Saudis were captivated and shocked by what happened in Tunis and Egypt but hadn?t collectively made up their mind about it? Well it appears that they have. Everywhere I go and everything I read points to a revolution in our own country in the foreseeable future. However we are still on the ledge and haven?t jumped yet. Iran: Whose Martyr is He? The Iranian pro-regime and opposition forces have each been battling to claim Saleh Jaleh as their martyr. He was killed by gunfire on February 14 when the opposition demonstrated in Tehran and several other cities. Yemen protests started in mid January with a self immolation and the arrest and release of Yemeni activist Tawakel Karman, and they have not really stopped since. A Day of Rage was organized for February 3 but tens of thousands were in the streets on January 27 as well as many smaller protests, throughout the time period. At least nine people were killed in the course of protests on Thursday against the Libyan leader Muammar al-Gaddafi. The demonstrators have taken hope from the uprisings in Tunisia and Egypt and are denouncing the squandering of Libya’s riches, the press writes. Anger and resentment has been seething not for months or years but for several decades across the Middle East. The particulars from one case to another differ obviously, but the complaints of corruption, petty and profound arrogance, and deafness to the demands for economic opportunity, a place to live, and respect for the dignity of the person are common. For younger people, the complaints often come down to the fact that a person cannot afford to marry, or live a decent, even marginally fulfilling life. I have heard these complaints firsthand and often in Egypt, Iran, Bahrain, Jordan, Syria and in the occupied West Bank and Gaza. Among U.S. political and media elites the pressing question for the past two weeks has been how will freedom for Egyptians be bad for Israel? This concern particularly extends to the notion that the Muslim Brotherhood, or any other group that is critical of Israel be permitted to share power in Israel. This concern misses the point that many, but by no means all Egyptians, are deeply critical of Israel. Even Egyptians well distant from the Ikhwan are often prone to underline that Egyptian cooperation with Israel probably reduced Israel’s incentives to pursue a resolution of the conflict that would end the occupation. Whether the Ikhwan is in or out of government, Egyptians’ distaste for Israel’s policies is likely to remain. Since the new year, almost every eight hours someone has been executed in Iran. The authoritarian backlash against the major uprising of 2009 has held Iranians in a climate of fear, but the protests this week mark a new chapter for the Green Movement. After 30 years of grinding poverty and repression, the people of Egypt have taken to the streets to call for change. But now that Mubarak is gone and political transition is underway, what reforms need to happen to satisfy the dreams and demands of the people? Horrific accounts of the barbaric pre-dawn raid in Bahraini capital Manama, in which protesters were dispersed by security forces from the Pearl Roundabout where they had set up camp to press for demands, continue to emerge, as Bahrainis and the rest of the world try to come to terms with what hit them. Afer 18 excruciating days, Hosni Mubarak the now former President of Egypt, finally and reluctantly left the scene on Friday morning turning over power to the army and a caretaker government as a popular uprising against his continued rule grew larger day by day. The workers supported Tahir; now Tahir must support the workers. from ORGANIZED RAGE by About us. Since Hosni Mubarak fled from Cairo, and even before then, some middle-class activists have been urging Egyptians, in the name of patriotism, to suspend their protests and return to work, singing some of the most ridiculous lullabies: “Let’s build a new Egypt”, “Let’s work harder than ever before”. They clearly do not know that Egyptians are already among the hardest working people in the world. ENERGY: The Arab World?s Triple Crisis A mere change of governments will not make Arab countries? economic problems go away. Indeed, the converging effects of population growth, climate change, and energy depletion are setting the stage for a looming triple crisis in the region. For those in countries that are working to topple brutal and oppressive regimes, there is a power that WikiLeaks cables have, one that can be tremendously beneficial. Cables from Tunisia, Sudan, Yemen, Syria, Algeria, Bahrain, Libya, Jordan, and Saudi Arabia all illuminate why the people of those countries would rise up against their governments. They compel people to acknowledge the magnitude of abuses and suffering that the people have been experiencing under autocratic regimes. News is emerging on Twitter that Libyan leader Mu’ammar Gaddafi has sent in the army against protestors, with deaths reported in Benghazi and other parts of the country. Gaddafi is one of the longest serving dictators in the world, now entering his 42nd year as President. There has been an intense debate on the possible route the Middle East and African countries could take after recent popular uprisings. Whether they would fall into the hands of ?fundamentalist Islamists? or if they can democratize in due course has been discussed for some time. WL Central will be updating news on Yemen, with new items added at the top. All times are ET in USA. You can contact me on Twitter @kgosztola or by email at [email protected]. Two days ahead of calls to protest the Gaddafi regime in a ?Day of Rage? on February 17, members of the Committee of the Families of the Victims of the Abu Salim Massacre came out to protest. Libyan attorney and human rights activist Fathi Terbil, who represents families that had family members massacred in mass prison killings that took place at the Abu Salim prison in 1996, was arrested. Terbil?s arrest led to an eruption of protests ahead of the planned ?Day of Rage. What’s up in Libya and in Arab World. A massive roundup.